Wedding festivities are kicking off for Ebie today, and I am so excited to be home to celebrate her! Ebie and several of my close friends are getting married this spring and summer, so I've got cute springy dresses on my mind! You are probably aware if you read my post on Tuesday... all about my favorite dresses out right now! But there's one dress that I did not include in that post because I'm devoting a whole blog post to it today! I have actually shared this dress before when I wore it to a friend's wedding last summer. However, I'm sharing it again today because it is such a fabulous option for any event this spring! 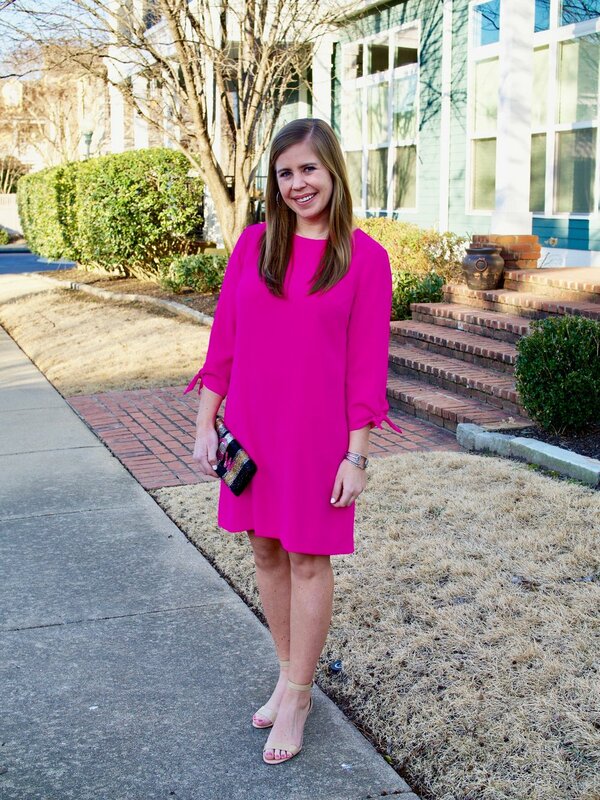 The vibrant color, tie sleeves, and classiness of this dress are some of my favorite parts. It is one of those dresses I'm so thankful to have in my closet because the style makes it perfect to wear for so many different reasons. It's conservative but also bright and fun! I added neutral shoes, a beaded clutch, and simple accessories to complete this look. However, when I wore it to my friend's wedding, I threw on some fun sparkly heels. Do you have any go to dresses that you are happy to have in your closet?! Thanks so much for reading! Have a great day!